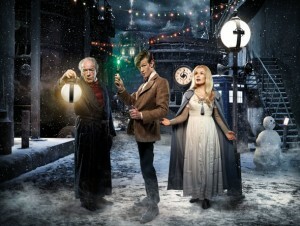 This is probably the best of the Doctor Who Christmas episodes since the show’s return in 2005. Of course, I’m ignoring last year’s epic two-parter in that assessment, but that wasn’t so much a Christmas story as the others. This year’s episode took me a bit by surprise because after hearing it billed as A Christmas Carol, I automatically assumed the worst. I’m happy to say that Steven Moffat proved those assumptions wrong in every way imaginable, and I didn’t have to suffer through an insufferable Tiny Tim at all. I’ll be the one spoiling Christmas from here out, so consider this a warning. It almost seemed like this was going to be two different episodes from the previews that showed Amy and Rory in a spaceship, while the Doctor was running around in a Victorian mansion. 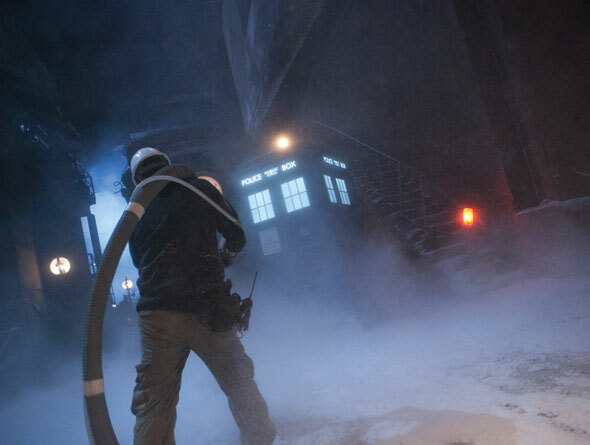 It all made perfect sense as the episode unfolded and the separation gave Matt Smith a lot of room to breathe without being on screen with his regular companions. This was very good to see after a season filled with their interesting dynamic. Michael Gambon (currently best known as Harry Potter’s Albus Dumbledore) was fantastic as the story’s “Scrooge,” Kazran Sardick. He really sold the complex and shifting emotions his character was going through perfectly. Writer Steven Moffat once again brought his unique perspective and concepts to this episode by creating a world that was very familiar yet included an atmosphere of crystal fog and flying fish. Describing both Christmas and Sardick’s character as each being “halfway out of the dark” added the proper foundation for what was to come via an interesting use of time travel presented in a very unique way. I have to say though, The Doctor deliberately changing someone’s past is out of character and breaks the rules he normally plays by. Time being rewritten was a big part of last season, but if this is a new direction for the show there have to be consequences. This irked me to the point that I even went to check some of the details (like the number on Isabella’s cryochamber at the start of the episode) to see if everything could have been exactly as it was meant to be and Sardick just forgot. That seems really unlikely given everything else that changed (like the the isomorphic controls no longer working for Sardick). We’ll see if this turns into an ongoing plot point. The one major complaint I have was the way BBC America felt the need to have words all over the screen. The episode’s title ran along the bottom seemingly throughout the broadcast and while I ‘m glad to know that Matt Smith was appearing on Graham Norton (I watched it. It was fun), I didn’t need the lower right corner of my screen to be covered by the news. If that’s all I have to complain about though, I really have no complaints. Every episode is somebody’s first and this one is perfectly suited for that purpose despite the way it plays with the rules. The fact that it aired on Christmas Day on both BBC One and BBC America so fans in the U.S. didn’t have to wait was a real treat. Check out the replay on BBC America January 1st at 8PM. If you can’t wait that long, episodes air every day this week at 5PM (replaying at 4AM and 10AM the next day) on BBCAmerica leading up to a marathon beginning at 1AM on December 31st that goes straight through into the replay of the Christmas episode. My personal highlights for what’s on this week are listed below, but really you can’t can’t go wrong with any of them. Matt Smith’s entire first season will air beginning Saturday morning at 7AM. A final incredibly exciting moment came during the credits when we got the first glimpse of what 2011 has in store as The Doctor comes to America once again.